All wood naturally aged and processed in our own facilities. Long bore with natural rubber linings in the wing and small bore of the boot joint. Choice of German (white) bell ring or French (metal) bell ring as well as corked or string wrapped tenons. Special resonant finish in light mahogany with flamed tiger striping. Ebony finish available on request. Silver plated keys and trim. Nickel silver key parts, hinges, and machined parts. Full German system with high D and E keys. Right hand whisper key lock. Rollers on F, A(flat), E(flat) and D(flat). Metal tubes extending into the bore in the finger holes of the wing and boot joints to prevent water from entering the tone holes. Spring posts are locked with screws. 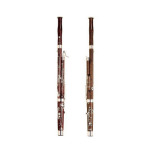 All Fox bassoons are designed to be played at A:440 but can be turned higher with a combination of shorter bocals and higher pitched reeds. Unless otherwise requested, the Model 601 comes standard with two *CVC* bocals, #2 and #3 lengths, silver plated. Professional case and cover, neck strap, seat strap, wooden crutch, polishing cloth and silk swab.